DID YOU KNOW || Spa owners who treat their hot tub cover with 303 Aerospace Protectant note that it helps make snow and ice accumulation easier to remove/brush off during the winter months? Originally engineered for aerospace and aviation applications, 303® Aerospace Protectant has found its way into millions of homes for day-to-day use on vehicles, sports equipment, patio furniture accessories, hot tub covers and so much more. Unlike many protectants that leave greasy residues, Aerospace Protectant dries to a clear matte finish. And because it’s water-based, this protectant is safe to use on all products, from your vehicle’s paint job and leather seats to internal engine parts. A premium surface treatment, Aerospace Protectant not only protects against fading, discolouration and cracking from harmful UV rays, but repels dust and stains, too. 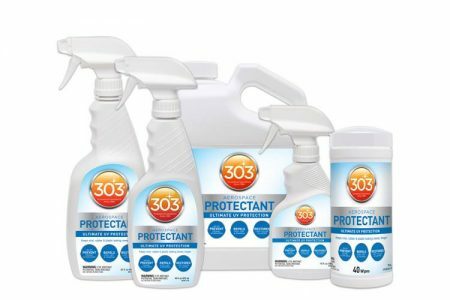 Readily available from leading retailers in Canada and the United States, 303 Protectant is a must-have product for spa and hot tub owners.